Are you looking for a particular instrument? Find out more about our want file. 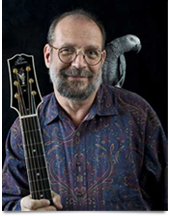 "George Gruhn knows more about guitars than anyone on earth," says Tom Wheeler, former editor of Guitar Player magazine. That knowledge has made Gruhn Guitars the world's most famous vintage instrument store and has brought George Gruhn worldwide recognition as an author of definitive books on vintage guitars, an innovative instrument and string designer, and a primary source for insight into the guitar market -- past, present and future. 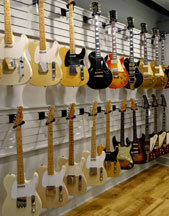 Gruhn Guitars has one of the world's premier collections of vintage, used and new fretted instruments -- the classic Martin, Fender, Gibson, Epiphone, Gretsch and Nationals. We also feature a wide selection of new instruments from Martin, Taylor, Collings, and others. How does a new Martin D-28 compare to a pre-war example? Gruhn's showroom is the place to find out for yourself. EXPERT INSPECTION AND REPAIR - Our staff of eight repairmen sees that all instruments are properly restored and set up in optimum playing order including set-up. For safe shipping, strings are loosened, moveable bridges on guitars and mandolins may be removed, and banjo necks may be separated from bodies. ACCURATE DESCRIPTIONS - Instruments are personally described by George Gruhn. We take pride in providing accurate representations of age, condition and originality. However, no brief written description can do full justice to an instrument. Our knowledgeable sales staff is prepared to offer detailed in-hand descriptions and to answer questions on the phone or via email. CERTIFICATION - With our written appraisal - free upon request with every instrument we sell - we authenticate and value your instrument.